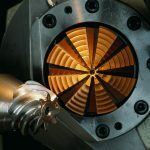 Isotropic superfinishing represents a value adding, low cost option for refurbishing both case carburized and nitrided gears. Multi-megawatt wind turbine gearboxes operate under demanding environmental conditions including considerable variation in temperature, wind speed, and air quality. 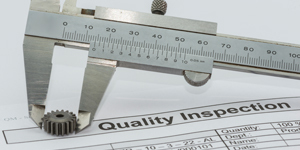 It is not uncommon for gearboxes rated for a maintenance free 20-year lifespan to fail after only a few years. These gearboxes experience several types of repairable damage including micropitting or “gray staining,” abrasive wear, foreign object debris (FOD) damage, surface corrosion, and fretting corrosion. Wear is greatest on the input stage, especially on the sun pinion gear. Historically, grinding is utilized to refurbish these damaged gears. There are numerous drawbacks, however, including but not limited to high capital investment and the extraordinary amount of time and skill involved in the grinding process. Moreover, nitrided gears cannot be ground and must be scrapped. 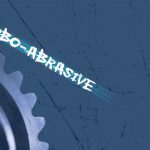 However, chemically accelerated vibratory finishing, or isotropic superfinishing (ISF), represents a value adding, low-cost option for refurbishing both case carburized and nitrided gears. 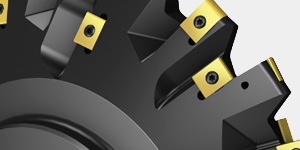 Isotropic superfinishing removes light to moderate gear flank surface damage. The result is a surface with a non-directional pattern with a roughness of approximately 0.08 mm or less. 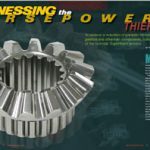 Moreover, evidence suggests that isotropic superfinishing imparts a finish that increases gear durability and service life in the field. A case study on a sun pinion gear is presented. Typical multiple megawatt (MW) gearboxes, 1.5 MW and higher, are designed to operate for 20 years without requiring major maintenance to the drive train. 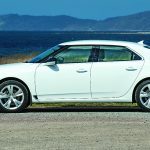 However, many owners are experiencing gearbox failures after only a few years of service. Gearbox repairs may cost $360,000 (USD) or more for a complete replacement by 2009 estimates . 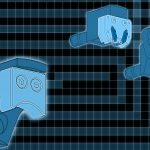 Gears fail for several reasons. Wind turbine gears operate under extreme environmental conditions including highly variable temperature, wind speeds, and air quality. These conditions cause variable high loading and torque. During periods of low or no wind, the loading on slowly moving or stationary gears is exacerbated. Moreover, moisture can contaminate the lubricant and condense on the gear surfaces forming sludge, corrosion and micropitting. Finally, dust and other foreign debris in the air can contaminate the lubricant during maintenance, leading to abrasive wear. Fortunately condition monitoring systems allow gearbox problems to be discovered before serious gear damage occurs [2, 3]. As mentioned, wind turbine gears experience several types of repairable damage including micropitting or “gray staining,” abrasive wear, foreign object damage (FOD), surface corrosion, and fretting corrosion. An example of each is depicted in Figure 1 [4, 5]. 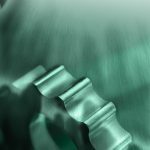 There are three main approaches to repairing gear damage: refurbishment by regrinding, refurbishment by surface finishing, or replacement with a new gear. 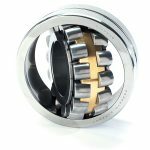 The refurbishment process is a combination of reclamation and reconditioning of a used gear or bearing . 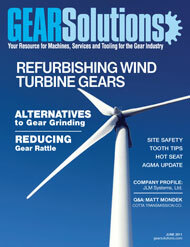 New gearing is expensive, which makes surface finishing and regrinding the preferred low-cost alternatives. Regrinding is necessary when lead and profile corrections are required on the working surfaces of the gear teeth . 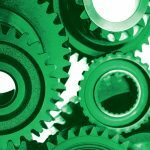 The Isotropic Superfinish, or ISF® process—henceforward referred to as superfinishing—is an alternative time and cost efficient method of gear refurbishment. The process utilizes conventional vibratory finishing equipment and high density, nonabrasive finishing media to produce isotropic surface finishes with a final surface roughness (Ra) below 0.10 mm. The superfinishing process is easily understood by referring to Figure 2. 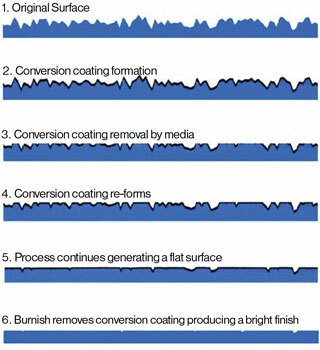 At the start of the superfinishing process shown in step 1 of Figure 2, the original metal surface reacts a first time with the active chemistry, forming the first conversion coating (step 2) . The vibratory machine and nonabrasive media produce an effective rubbing motion on the surface of the gear (step 3). This exposes the peak asperities of the metal surfaces to a second reaction (step 4), reforming the complete conversion coating. The process of conversion coating reformation and removal (step 5) is continued through many successive cycles, thus planarizing the original rough machined or damaged surface. 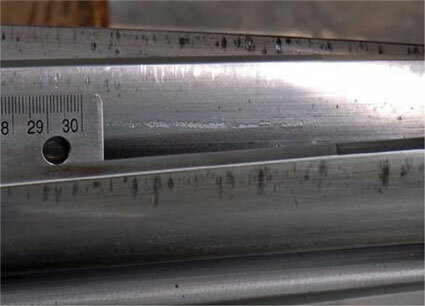 The final required surface finish governs the total number of cycles. This planarizing process is continued until the gears are smoothed to the required surface finish quality. Once the required surface finish quality is achieved, the active chemistry from the smoothing stage of the superfinishing process is drained away and a neutral, burnishing soap is introduced into the vibratory machine. 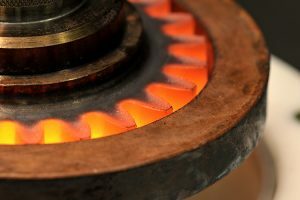 The burnish removes all remaining conversion coating (step 6) from the surface of the gear, producing a mirror-like appearance while imparting a mild rust preventive to the surface. The gear is ready for unloading and the superfinishing process is complete. 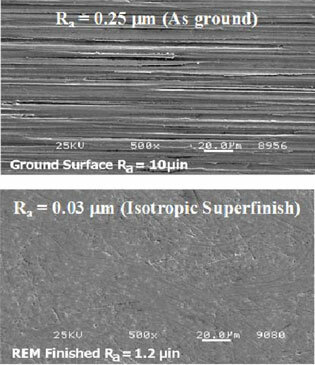 Figure 3 shows a comparison of a ground gear surface versus a superfinished gear surface. 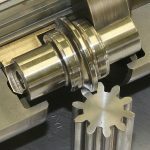 The initial selection of the proper media shape, size, and mixture is a significant part of the art to successfully superfinishing gears. Media is specifically chosen based on the following criteria: root diameter, diametral pitch, gear size, gear mass, and alloy. Once the media is chosen, the superfinishing process repeatedly finishes gears identically. The media is nonabrasive, and therefore has a very low attrition rate. The size, shape, and density of the media remain stable over thousands of hours of vibratory machine operation. 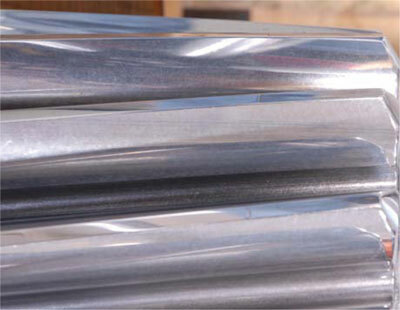 The superfinishing process possesses several ideal features. 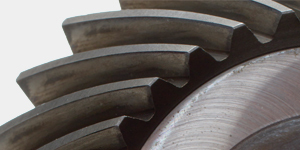 • Superfinishing can also remove light (≤25 mm depth) to moderate (≤130 mm depth) damage from the gear tooth surface while maintaining geometric tolerances. Figure 5 shows images of the graphite tape lift method that is used to measure and record the amount of micropitting on a gear flank . The deepest micropitting damage is approximately 150 mm (see arrows). 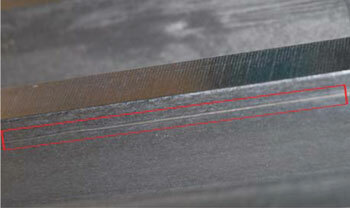 In this instance, it is apparent that some micropitting remains after superfinishing. The removal of all damage may have compromised the geometry of the gear. However, the peak asperities or “stress raisers” were removed and the existing micropitting will, in all likelihood, not progress to pitting and eventual spalling . Recently, gearbox manufacturers indicated between 150-250 mm can be safely removed without compromising gear geometry (maximum removal amount is per customer specifications). 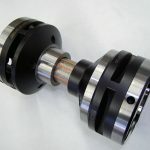 Gear refurbishment via superfinishing was evaluated for bending fatigue, contact fatigue, and scoring resistance tests on military helicopter gears by the Gear Research Institute (GRI) [14, 15]. 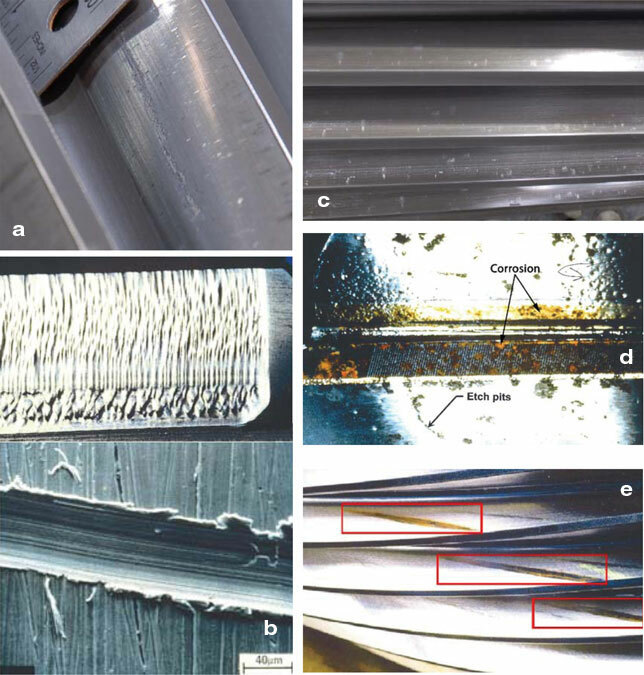 Importantly, GRI results suggest that “in all three tests, the repaired gears met or exceeded the performance of the new gears.” Figure 6a depicts profilometer traces of (a) new ground gear, (Figure 6b) used gear prior to refurbishment, and (Figure 6c) used gear after refurbishment via superfinishing. 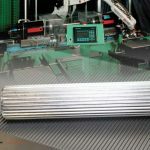 Superfinishing has several distinct advantages over regrinding in terms of time and cost savings. First, the process does not require engineering drawings. Second, all teeth are uniformly and simultaneously finished. For example, the cost per tooth is the same for a small gear with 59 teeth versus a large gear with 113 teeth. Third, as described superfinishing requires less setup time and potential complications versus grinding. Consequently, the turnaround time is rapid. Fourth, typically the ring, sun, and pinion gears of the low-speed stage and the output pinions of the high-speed stage receive the most wear and are refurbished. However, the gears of the intermediate stage, especially an assembled intermediate unit, also can be superfinished with little additional expense since the entire gearbox is removed for maintenance. Figure 7 depicts a refurbished assembled intermediate stage gear. 7) The Ra of the superfinished refurbished gear was determined to be 0.07 mm (refer to Table 2). 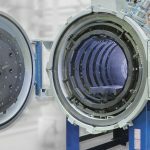 In the case study discussed, the planet and hollow wheel (ring) gears were also successfully refurbished. 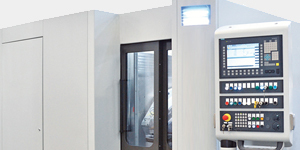 Customers utilize CMM to determine if the gears are still within tolerances after the parts are returned. All gears—with more than 2300 refurbished to date—remain within the required tolerance. In the majority of cases, all traces of micropitting and other moderate tooth damage can be successfully removed with superfinishing. Even if the micropitting is too deep to remove completely, the peak asperities or “stress raisers” are removed and micropitting will not progress to pitting and eventual spalling. Moreover, superfinishing will remove the raised lip around the lip of a FOD dent even if the valley of the damaged area is not completely removed. Gears with severe subsurface micropitting or in need of tooth profile correction must be reground first. However, it is still advantageous to use superfinishing as the final step in order to impart a much longer service life. Ongoing field tests, now more than two years old, are being conducted to corroborate that superfinished wind turbine gears have equivalent or superior performance versus new ground gears. Currently, refurbishing wind turbine gears via superfinishing is in commercial operation as a viable replacement to regrinding by a major wind turbine gearbox manufacturer. 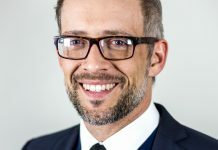 In terms of time, cost, and in-service performance superfinishing has several distinct advantages. The majority of damage sustained on in-service gears in wind turbine gearboxes can be successfully refurbished by superfinishing. 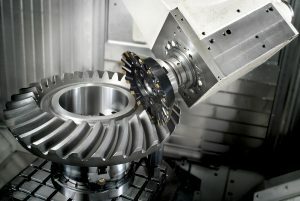 Superfinishing is time efficient and economical since all teeth are finished simultaneously versus a few teeth at a time, large gears finish in the same amount of time as small gears, proprietary drawings or expensive reverse engineering is not required, and nital etch inspection is unnecessary. Also, the equipment is inexpensive when compared to regrinding, and setup is simple and does not require extensive operator training. Typically the ring, sun, and pinion gears of the low-speed stage and the pinion gears of the high-speed stage that acquire the most wear are refurbished. 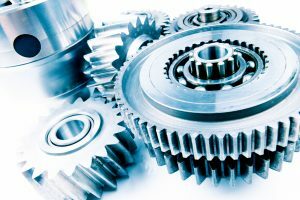 However, the gears of the intermediate and assembled intermediate stage can be refinished with little additional expense since the entire gearbox must be removed for maintenance. 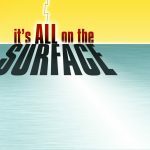 Also, superfinishing can reveal pre-existing subsurface damage concealed by grinding or in-service wear related smearing. 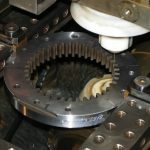 Previous studies by independent sources indicate that refurbishment of used gears by superfinishing results in extended operational life and reduced maintenance costs. 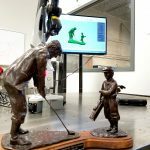 And finally, when regrinding may be the only way to remove the deep damage and reshape tooth geometry, superfinishing afterward will result in more-durable surfaces and, hence, a gearbox with greater longevity in the field. 2) Dinwiddie, K., Operations & Maintenance Real World Solutions. Presented at the STLE 65th Annual Meeting and Exhibition Wind Turbine Tribology I, May 2010. 4) Errichello, R., Technical Training Seminars: Gear Failure Analysis, American Gear Manufacturers Association, 2007. 5) Franke, J.-B., Grzybowski, R., Lifetime Prediction of Gear Teeth Regarding to Micropitting in Consideration of WEC Operating States. Presented at DEWEK 2004: The International Technical Wind Energy Conference. 6) Flowers, K., Bearing Repair Provides Valuable Alternative to Bearing Replacement for Heavy Industries, Iron & Steel Technology, 2009, 6 (6), 85-89. 7) Schmid, R., Process for the Modification of Tooth Traces and/or for the Correction of Tooth Trace Deviations of a Gear, United States Patent 6,752,695 B2, May 22, 2004. 8) Arvin, J., Manesh, A., Michaud, M., Sroka, G., Winkelmann, L., The Effect of Chemically Accelerated Vibratory Finishing on Gear Metrology, American Gear Manufacturers Association, 2002. 9) Dini, J.W., Fundamentals of Chemical Milling, Am. Mach., 1984, 128, 113-128. 10) Lynwander, P., Gear Drives Systems, Marcel Dekker: New York, 1983. 11) Astakhov, V. P., Surface Integrity in Machining, Ed. 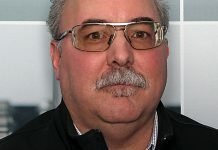 J. P. Davim. Springer: 2010; pp. 1-35. 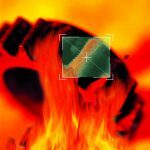 12) McNiff, B., Errichello, Musial,W., Documenting the Progression of Gear Micropitting in the NREL Dynamometer Test Facility, AWEA, 2002. 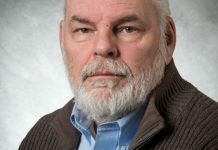 13)Michaud, M., Summers, E., Superfinishing Large Planetary Gear Systems, European Patent EP1646477, April 29, 2009. 14) Rao, Suren B., Repair of CH-46 Helicopter Gears, Journal of the Reliability Information Analysis Center, First quarter, 2007. 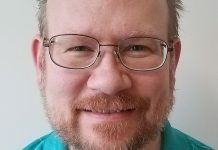 15) Rao, S., McPherson, D., Sroka, G., Repair of Helicopter Gears, American Gear Manufacturers Association, 2005.
joined REM Surface Engineering, Inc. in 2009 as a Senior Research Chemist where he has been tasked with developing new surface engineering processes and products.